James Beard is committed to providing excellence in dentistry, and stands out as a leading dentist in Edwards. The doctor uses the latest in dentistry techniques to provide you with a beautiful and healthy smile. Additionally, James Beard believes strongly in education to prevent oral health problems before they occur, and makes sure to keep patients fully informed about their dental health. Read more about Edwards dentist James Beard below. Dr. Beard grew up surrounded by the orchards and vineyards of the central California community of Modesto. He attended Stanford University where he majored in the biological sciences. After receiving a Bachelor of Science degree, he went on to do post-graduate research in neuro-biology. His research focused on the study of the induction mechanisms of hibernation in mammals and earning his first Master’s degree. Following Stanford, Dr. Beard moved on to the Ivy League, receiving his Doctor of Dental Medicine degree from the prestigious University of Pennsylvania School of Dental Medicine. While at Penn, he was a selected to be a member of a select group of students who in addition to the normal dental curriculum, worked closely with dual specialists in the Department of Periodontal Prosthesis. As a result of this exposure, Dr. Beard enhanced his skills in both Periodontics and Prosthodontics while providing comprehensive diagnosis and treatment of the most severely compromised periodontal patients. This training helped in meeting the challenges of a General Practice Residency Program at Michael Reese Hospital in Chicago. At MRH he received advanced training in all dental specialties as well as hospital dentistry. Days (and nights) included treatment of medically compromised patients, emergency room trauma patients, and rotation through the anesthesiology program. Dr. Beard received both his specialty Certificate in Periodontics and Master of Science in Periodontics from Northwestern University School of Dentistry. As a result of his many years in private practice, Dr. Beard excels in comprehensive treatment planning for the most advanced cases. His experience has made him proficient in diagnosis and treatment of periodontal disease, pre-prosthetic bone grafting procedures, dental implant therapy, and a full range of cosmetic and corrective periodontal procedures. His current emphasis is in the area of aesthetic and regenerative periodontics and site development for placement of dental implants. Dr. Beard is a member of the Illinois Society of Periodontists and American Academy of Periodontology. He has been licensed to practice periodontics in Colorado, California, Illinois, and Wisconsin. Need an appointment with a dentist in Edwards ? Requesting an appointment at our Edwards, CO family and cosmetic dental office is now easier than ever. Fill out the form below and we'll contact you to find a time that fits your schedule. Start your journey towards a beautiful smile with us today! 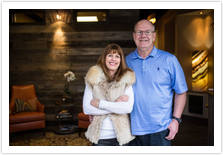 Dr. James Beard- Your #1 Periodontist serving Edwards, Avon, Vail, Glenwood Springs, Eagle, Gypsum, Minturn, Leadville, Carbondale, Rifle & beyond!